The fatal flaws of the U.S. dollar and other currencies aren't anything new. They've been around for over 40 years, and you can thank President Nixon for that. The problems started well before him at the height of World War II — he just presided over the era when an intrinsic flaw in a global agreement put national interests over sound monetary policy. In 1944, the Bretton Woods conference of 44 allied nations produced a system of fixed exchange rates based on the U.S. dollar, which was redeemable for gold by the U.S. government at the price of $35 per ounce. Other nations fixed their exchange rates to the U.S. dollar, and the United States was committed to backing every dollar overseas with gold. At the time, it made sense. The developed world was highly leveraged based on the U.S. dollar, and America was at the height of its power relative to the rest of the world. However, as Germany, Japan, and other nations recovered between 1950 and 1969, the U.S.'s share of the world's economic output dropped from 35% to 27%. A negative balance of payments incurred by the Vietnam War, the Great Society programs, and monetary inflation by the Federal Reserve caused the dollar to become increasingly overvalued. U.S. gold reserves were taxed beyond a sustainable level, creating an unsustainable drain on U.S. dollars that could not persist. Attempts to rig the system and suppress the price of gold through the London Gold Pool ultimately failed. Market forces can be distorted and delayed but will ultimately conform to reality. By 1971, America's gold stock had fallen to $10 billion because of currency-to-gold conversions of international foreign reserves. The value of America's gold reserves fell roughly 50% in the eleven years since 1960. Foreign banks held many more dollars than the U.S. held gold, leaving the U.S. vulnerable to a run on its gold reserves. The London Gold Pool, a shared stockpile used to manipulate gold into a stable price, was failing too. Facing ever-increasing budget deficits that would only make the situation worse, the Nixon administration shocked the world by unilaterally abandoning the Bretton Woods system on August 15, 1971. Since then, there has been nothing to control the value of the dollar or any other major currency. They all freely float and have no basis besides blind faith. The U.S. dollar, unhinged from any controls, started on a new trajectory. It constantly shed value as inflation constantly grew. To maintain wealth, everyone in the U.S.A. had to grow their savings by almost 240% over the last thirty years. Considering many lower and middle class people didn't have excess income to pour into the stock market, inflation has already left them in a poverty trap. 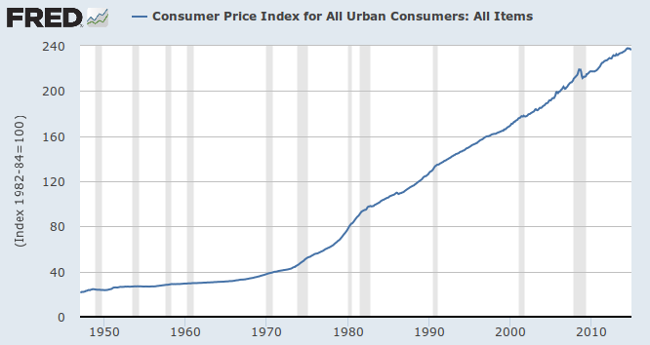 This is just the official Consumer Price Index (CPI) data, too. There are many ways to measure inflation, and the official methodology is far different today than it was between 1982 and 1984. 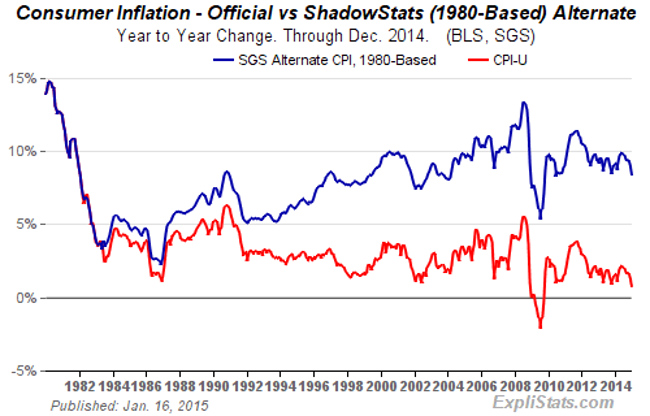 The way inflation is calculated has changed more than 20 times since 1978. All of the changes have been used to tweak the official rate of inflation lower. The latest change uses “chained CPI.” It creates categories of substitution. So it doesn't matter if you were to buy fresh produce because frozen alternatives exist. Fresh high-quality beef can be replaced by cheap ground beef. Low-fat healthy chicken can be replaced with frozen piecemeal patties. While you'd have to pay more to maintain quality of life, that is completely removed from official figures. If there is any potential for you to use an inferior and cheaper substitute, the government assumes you are trading down and doesn't recognize the inflation. You'd think the government would be a bit more cautious, but the Fed is actually struggling to boost inflation. The goal is to get the official inflation rate above 2% and possibly as high as 5%. With the unprecedented expansion of the Fed's balance sheet through quantitative easing and the massive expansion of the monetary base, there is already massive potential for inflation baked into the U.S. dollar and economy. There is a very real risk that the Fed will overshoot the target without any means to control inflation afterwards. Anyone with savings, retirement funds, or wealth needs to find ways to hedge the risk. There is no reason to pull out of the market... at least not yet. However, establishing positions in gold, inflation-proof currencies, or inflation-protected bonds now is a wise and prudent approach to the problem. Warren Buffett always laughs off gold, famously announcing that he doesn't understand why we dig it out of the ground, melt it, and then put it back in the ground. "It has no utility," he says. The yellow metal has a much longer successful track record as a global store of wealth than Berkshire Hathaway could ever hope to attain. His message isn't really anti-gold, though. It's more pro-stock — because that's where he and the establishment need your money to be. Gold outlasts countries and empires and regimes and centuries. Stock markets don't. And it certainly has more intrinsic value than the sheets of pressed wood pulp we're using by the trillions as the nation's life support. Gold is an unusual asset. It's an asset that people hold as disaster insurance. A lot of people hold gold as an inflation hedge. But movements of gold prices don't predict inflation very well, actually. Nobody really understands gold prices and I don't pretend to understand them either. Certainly if Ben doesn't understand gold, no one possibly can. Honestly, it's not that hard to understand. Gold is the best alternative when investors are worried about the soundness of fiat currencies. Unprecedented central bank intervention around the globe was unproven and very risky. The Federal Reserve started buying debt from banks in November 2008. Gold was at $750. By March 2009, the Fed held $1.75 trillion worth of bank debt. Gold was at $950. By June 2010, the Fed held $2.1 trillion of bank debt, mortgage-backed securities, and Treasury notes. Gold was at $1,250. QE2 started in November 2010, and the Fed had bought another $600 billion in Treasury securities by June 2011. Gold went to $1,550. QE3, known as QE Infinity, was announced in September 2012. Gold was at $1,550... and went to $1,800. 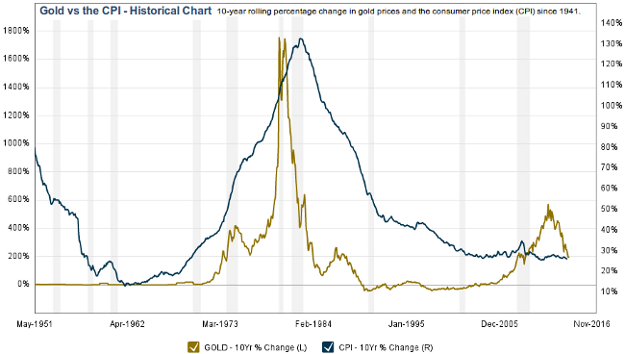 Then, as unemployment rates were manipulated, inflation hidden, and GDP retroactively "adjusted"... gold began falling. And it fell right on through to mid-June, when Bernanke announced he might start tapering. Gold rose rampantly through three and a half years as the Federal Reserve pursued policies that debased the value of the U.S. dollar.... then it fell drastically as the government messed with economic data to make it appear as though the economy was healing. But now we're starting to learn that the economy is hardly recovering at all, and most signs of a rebound have been artificially engineered. As a hedge against an inevitable market crash when the candy is taken away. While the Federal Reserve Chairman may not understand gold prices, I think they're pretty straightforward. We're looking at a chart of rolling ten-year averages of gold prices and the consumer price index — the official measurement of inflation used by the government and the Fed. As we can see, the average change in the price of gold over the last ten years now matches the average official rate of inflation over the last ten years. This coincides with gold hitting resistance at around $1,200 per ounce. At this price, many gold mining operations become unprofitable, supply constricts, and exploration and development grind to a halt. This is a very strong foundation of support for gold prices. A lot of the speculators who were trying to use gold as a short-term profit-maker have been shaken out of the market. Gold can now be safely used for its traditional purpose — as a store of wealth and a hedge against inflation in fiat currencies. On November 1, 2008, a man calling himself Satoshi Nakamoto posted a research paper to an obscure cryptography online email list describing his design for a new digital currency. The Bitcoin system would be convenient, virtually untraceable, and completely independent from government or bank oversight. Bitcoin would also never experience uncontrolled inflation. Transactions are monitored and recorded by an entirely decentralized computer network. Computers running the software that builds the public ledger compete to solve irreversible and incredibly complex cryptographic puzzles. Every ten minutes, a “bitcoin miner” with the best answer to the puzzle is awarded 25 newly minted bitcoins, and the associated block of transactions is added to the permanent ledger chain. There are about 16.4 million bitcoins in circulation now, and it is getting more and more difficult to create new bitcoins over time. The number of new bitcoins created each year is automatically halved over time, until bitcoin issuance halts completely with a total of 21 million bitcoins in existence. As a result, Bitcoin experienced rapid inflation as it was introduced, and the inflationary rate is falling all the time. In 2013, it was around 12.5%, and 56% of all bitcoins that will be created were already in existence. However, today with 75% of all bitcoins already created, the inflation rate has fallen below 4%. From here on out, the inflation rate will become incredibly low. While inflation is going to be high compared to national fiat currencies for the next couple years, the evolution of Bitcoin value and use strongly supports investing now while it is at an attractive exchange rate. At the pace merchants and consumers are adopting bitcoins, in a few short years, any early investors in Bitcoin will see large gains turn into inflation-proof savings. Another advantage is how bitcoins can be divided down to eight decimal places. Many online exchanges will sell fractions of a bitcoin for as low as $20. Considering how revolutionary the new currency is, it is advisable to ease into it. You can make small investments and slowly build a position while learning how to safely store and manage Bitcoin accounts and information. As we get older, the common advice we all receive is to start moving our retirement savings and wealth into less-risky fixed-income assets. Bonds are a great way to avoid the risks of the stock market, but they are highly vulnerable to inflation. For this reason, U.S. Treasury inflation-protected securities (TIPS) were created as an easy way to eliminate inflation risk while providing a real rate of return guaranteed by the U.S. government. TIPS function like normal bonds with one key difference that completely changes their value to investors: They keep pace with the official CPI. TIPS will have different face values and interest rates compared to normal bonds, depending on inflation expectations. Here is a quick example: Let's say you buy a $1,000 TIPS bond with a 3% coupon. If inflation during the first year were 10%, the face value of the TIPS bond would adjust upward to $1,100. At the same time, the interest rate would shift up 10% too. You'd get an extra 10% of the 3% coupon, meaning you'd get $33 instead of $30 over the course of that year. Normal bonds will not do any of this; they have an inverse relationship with TIPS. When inflation is high, TIPS become more valuable, and normal bonds fall in value. When inflation is low, normal bonds have an advantage because future interest payments become more valuable on a real basis (after inflation). Of course, you can always mix and match. Owning both normal bonds and TIPS will add an extra layer of diversification. When one type of bond rises and the other falls, they will offset each other and reduce portfolio volatility. TIPS can be purchased either directly from the U.S. Treasury or through a bank, broker, or dealer through the auction process based on their yield. As an alternative to the direct purchase route, there are also bond funds available to investors that match the performance of the TIPS themselves. Typically, these high-quality funds and ETFs will invest at least 80% of their funds in inflation-protected bonds. The upside with these funds is that their investors get the added benefit of professional management. Moreover, these funds offer the liquidity that most investors need. After all, while it may be quite easy to purchase TIPS directly, selling them is another matter entirely. Bond ETFs, naturally, make that prospect a breeze. Vanguard Inflation-Protected Securities (MUTF: VIPSX): The fund invests at least 80% of assets in inflation-indexed bonds issued by the U.S. government. It may invest in bonds of any maturity, though the fund typically maintains a dollar-weighted average maturity of seven to 20 years. iShares Barclays TIPS Bond (ETF) (NYSE: TIP): The fund invests at least 90% of its assets in the inflation-protected bonds and at least 95% of its assets in U.S. government bonds. It may also invest up to 10% of its assets in U.S. government bonds not included in the underlying index. Additionally, the fund invests up to 5% of its assets in repurchase agreements collateralized by U.S. government obligations and in cash and cash equivalents. For now, inflation is very tame, and the need for these investments isn't strong. However, we know for a fact more inflation is coming. The Fed will be doing what it can to cause it. If and when the economy regains strength, we'll see prices jump even more. With these three tools, you can either establish a hedge in your current portfolio, or you will know where to go when inflation rears its ugly head again. Here at the Outsider Club, we will continue to watch the economy and markets to provide expert research and analysis for our readers. You'll start receiving our free newsletters within a couple days. Stay tuned for more information you can use to protect and grow your wealth.